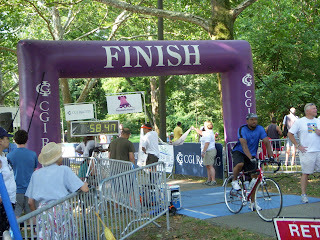 Went out this morning to go biking and to watch the CGI Triathlon along West River/Martin Luther King Drive. What an unexpected adventure it turned out to be! I met up with Sue, a woman I met via the SheRox bike training ride this past week. Got to her house around 7:20 am, and she discovered she had a flat tire. We fixed it and headed "up the river". It would be flat tire #1 of the day. 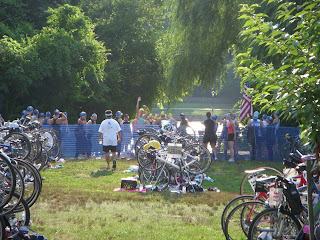 We pedalled around the starting course of the tri, watching the swimmers take to the water in their various wave phases. Then we went a bit further upstream to see the swimmers in the water. It was a more comforting feeling watching a similar distance tri; I don't feel as anxious about the swim distance now that I've seen the 1/2 mile course. I picked up a lot of good ideas for what I can still do to train realistically given my time and physical limitations. I'd like to start swimming in a longer pool. 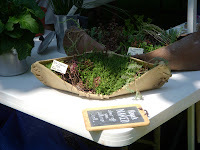 Actually, I did learn about a 50 meter public pool, the Kelly Pool, next to Memorial Hall in Fairmount Park. Sue and I rode up to it during our biking sojourn and it's beautiful. Given it's Olympic size, I think swimming in it will do me worlds of good to improve my technique and to not rely so much on the shorter 25 meter pool I'm currently using. After watching the swimmers, we went over to the vendor areas to look at tri clothes. I am sure I now know what sort of shirt I should wear for the event. It really comes down to a good sports bra or two for me, and a tight running shirt. Another area almost accomplished. 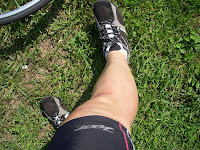 We picked up a few Luna nutrition sports products and I learned about a new sports drink that isn't loaded with sugars. We did watch a bit more of the tri, but it is a lot of hurry up and wait. Some of the duo runners/bikers/runners were just finishing, and the first wave of swimmers who had transition to the bike portion of the race had just completed the first bike loop of the race. Sue and I headed up to look at the pool and to tackle a few miles of hills and roads. That's when she got her second flat and part 2 of our adventure. After we changed the tube again and were about to head up the road to parts unknown, I crashed and tore up my seat saddle and scrapped my knee in the same spot where I busted it up a few weeks ago! Road Rash badges of honor. Those darn toe clips! We weren't even taking off yet when Sue stopped and I couldn't maneuver fast enough so I banged into her back tire and ground myself into the side of the road and gravel. The cut is minor and no sprains this time. But my seat is ripped! Ah, another reason to head to the bike shop. 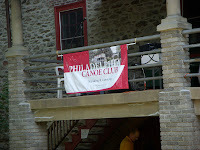 Adventure #3, along with the third flat tire occurred at the Philadelphia Canoe Club, a hidden oasis along Ridge Avenue near the start of Mains Street in Manayunk. 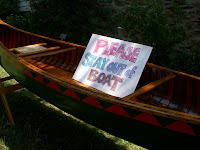 Sue is a Dragon Boater, and an canoe outrigger. 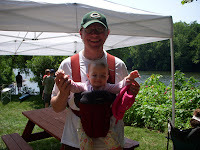 She wanted to check out the PCC Open house so I went along for the ride. What a treat! Every time I head out on a ride I get to discover and explore so many new places in the City. We hung out and and enjoyed the pretty. Sue and I both picked up information about the club, and we both ran into people we know. I saw Ben with his beautiful baby girl, Violet; his wife and Violet's twin brother, Oliver, were out on their own adventure elsewhere. 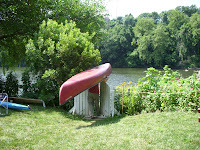 If I can, I'd love to start paddling and taking up the canoe or kayak. Ben thought he might like to take up the sport. For the moment, I'll stick with the biking. I can't afford another sport or else I'll be literally up the river without a paddle if Liz has a say about my hobbies and sporting indulgences! Poor Sue, when we left the Canoe club, her tire was flat again. The tube we used was defective. We stopped once every mile during the 5 mile ride along Kelly Drive to pump up her tire so she could make it back to Boat House Row. 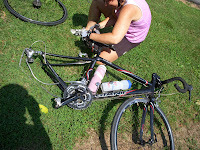 Breakaway Bikes has a bike rental stand, so she got the mechanic to fix the flat and change the tube. Since I had just bought the spare from their shop, the mechanic only charged for the service. What a day! 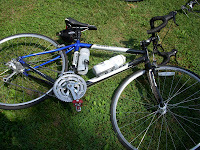 We rode about 20 miles from start to finish, in short increments. 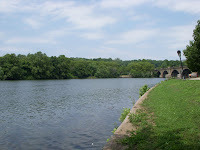 We saw a lot of Fairmount park and various sights along the way. I discovered a beautiful new spot and sport and got in a fair amount of "research" for my triathlon.